In 1991, we didn't get a good photo of this turtle, but we did capture an identifiable profile from videotape. Even in this low quality image, you can see no hint of what was to come. By 1992, 91-10 had developed a large protruding tumor that covered the left eye completely. 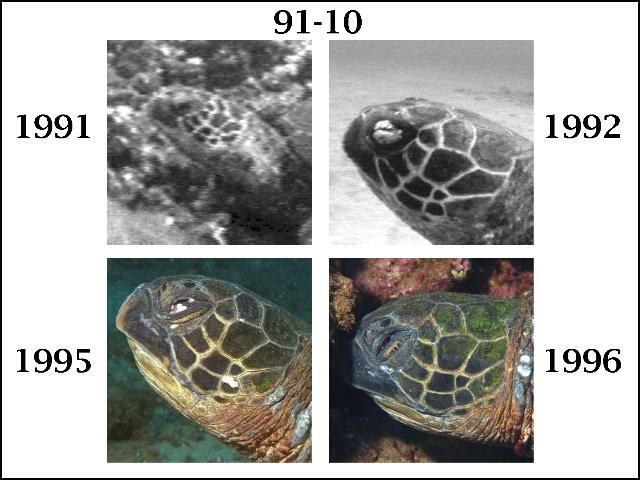 We didn't see this turtle in 1993 or 1994, but in 1995 91-10 was frequently seen at the Turtle House. The left eye was completely gone, and the cavity contained some white globules that we couldn't identify. In 1996, the eye was usually shut but when we did see it open, the white globules seemed to have disappeared. Not evident in these images is the condition of the right eye, which had an even larger tumor but was not eaten away in the same manner. Nevertheless, the combination of the eye tumors rendered 91-10 virtually blind.